On the evening of May 7, 2016 TASCHEN Store Milan hosted the acclaimed artist Christo. 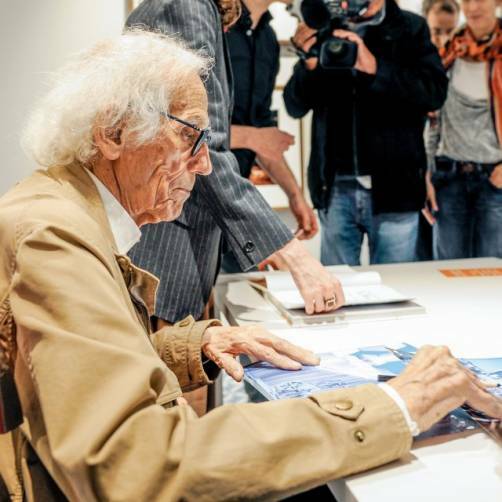 Christo welcomed guests and signed copies of his new book, Christo & Jeanne-Claude. Floating Piers. Published on the occasion of Christo’s highly anticipated Floating Piers project at Lago d’Iseo from 18 June to 3 July, this new TASCHEN edition gathers Christo’s sketches, models, documents, and designs to reveal the complete process behind Christo’s first large scale project since Christo and Jeanne-Claude realized The Gates in 2005.